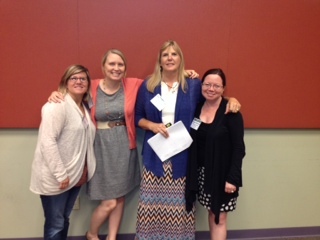 Emily Perry, Executive Director of Susie’s Place Child Advocacy Center, with locations in Avon and Bloomington, IN is attending the National Children’s Alliance Accreditation Bootcamp held in Huntsville, Alabama. This training is designed to prepare Children’s Advocacy Centers to successfully achieve accreditation through the National Children’s Alliance. Emily Perry, Susie’s Place Child Advocacy Center; Cerina Marlar, Midwest Regional Child Advocacy Center; Jan Dunn and Alyson MacKenzie, National Children’s Alliance. Child Advocacy Centers undergo an accreditation process that includes 10 standards established by the National Children’s Alliance board of directors that ensure effective and consistent delivery of services. Children’s Advocacy Centers have the latitude to focus the standards to meet the unique needs of individual communities. The accreditation process ensures that Children’s Advocacy Center programs adhere to rigorous standards to ensure effectiveness in helping children heal from the effects of abuse. There are more than 700 Children’s Advocacy Centers located across the country with services that generally include Forensic Interviewing Services; Forensic Medical Evaluations; Victim Advocacy and Support; Specialized Mental Health Services and Community Education/Outreach. Current National Children’s Alliance accredited Children’s Advocacy Centers in Indiana include: Dr. Bill Lewis Center for Children in Fort Wayne, Allen County; Child Advocacy Center Child Advocacy Center, a Division of Meridian Health Services in Muncie, Delaware County; The Child and Family Advocacy Center in Elkhart, Elkhart County; and McKenzie’s Hope in Huntington, Huntington County.